The Pinterest pin is definitely a teaser for a scrumptious and simple lobster bisque recipe. I started early this morning breaking apart 2 lobsters in to tail, claws and legs. 1 bunch of celery with leaves; washed thoroughly. Hold the bulb end and trim 1/2 inch from the top then cut into thin slices all the way down to the bulb. Do not cut into the white portion. 3 medium yellow onions; diced. In the largest stock pot you own, melt the butter. Add the olive oil and add all the diced vegetables. Season with salt and pepper but don’t overdo it. There is plenty of sodium in the broth and the soup base. You can always adjust the seasonings later. Sauté the vegetables and stir well to combine them evenly as they cook. When the onions have take n on some color, place all the lobster shells in the stock pot. With a large spoon, stir lobster shells and diced vegetables until well combined. Pour 2 full cartons of seafood bisque plus about half of the third carton over the vegetables and shells. Add the tomato paste. Stir to dilute. Add the bay leaves and thyme. Taste the broth and add seasoning if needed. Stir well to distribute the vegetables throughout the shells and the broth. Cover and simmer over low heat for a full hour. Allow the broth to cool sufficiently to be able to remove the shells from the stock. With an immersion blender, the following process is very easy. Check out the model below and other models of hand blenders. The following step will be safer to ensure that all pieces of lobster shell are removed from the broth. Yes, it takes longer but this step is necessary. Keep putting the pureed vegetables back in to stock until you have reduced all the veggies to a purée. Set aside the soup base. Mine was refrigerated until the following day. Remove the milk, cream and lobster meat from the fridge. Reheat the soup stock over medium heat until it bubbles gently then lower the heat to the lowest possible heat setting while you prepare the crab meat. Add the milk and cream about 10 minutes before serving, stirring to combine well. Heat through for about 5 minutes. You do not want the cream to curdle so do not add it until you know you will be serving the soup. Prepare some garlic butter and melt in a medium shallow pan – a pan large enough to hold all the lobster meat in a uniform shallow level. Heat through. 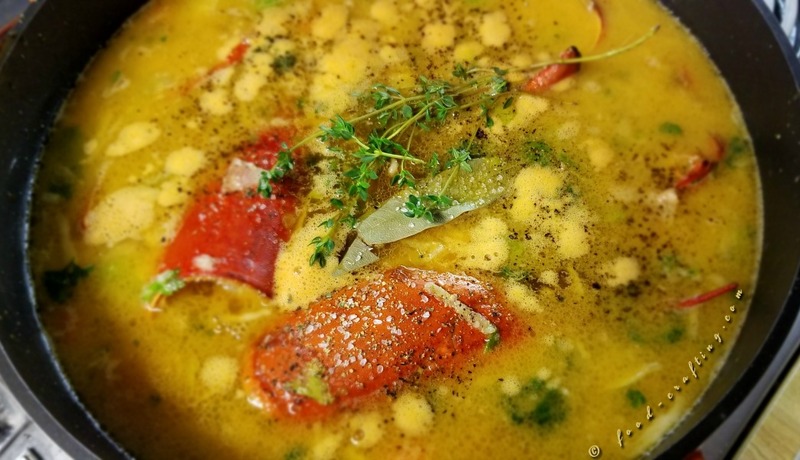 Spoon a quantity of lobster meat into each bowl and ladle hot soup over the crab meat. You’ll be amazed at how much liquid is retained in the shell of a cooked lobster. Break them apart over a bowl so you can keep all that liquid to add to the soup stock. At the seafood counter of your supermarket, have the lobsters cooked for [5 minutes only] . Make sure you ask to have them cooked IN A SOLID TRAY not the typical perforated tray. That’s how you keep all the cooking liquid that drains from the lobsters as they cook. Imagine the flavor bits you can add to the broth. Break up the lobsters into pieces and remove all the meat. You won’t be able to remove the meat from the legs in small lobsters but it will add tremendous flavor to the broth as the soup base cooks. Set aside while you prepare the soup base.